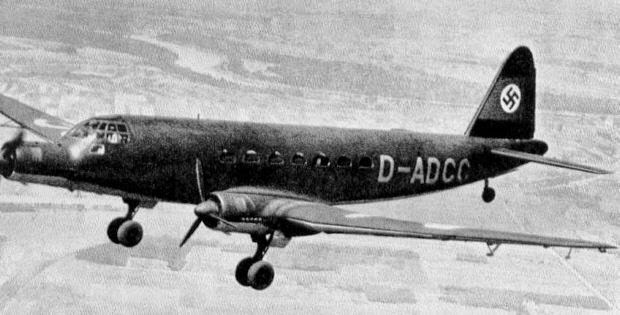 The tremendous success of the pre-war Ju 52/3m airliner naturally led Junkers to look for a successor, and after several designs settled on the Ju 252. However, the Ju 252 was a metal aircraft and the raw materials were in short supply for transport aircraft, as were the Jumo 211F engines. In order to redress this, Junkers began design of a wooden version powered by three 1,000 hp (746 kW) BMW-Bramo 323R-2 radials in the spring of 1942. The resultant Ju 352 superficially resembled the Ju 252, but the wooden wing was mounted further back on the fuselage, which itself was a composite structure. It was marginally larger than the Ju 252 but easily distinguished by its squared tail fin rather than the rounded one of the Ju 252. Incorporated in the rear was the Trapoklappe, a hydraulically-powered loading ramp which allowed the rapid loading of bulky items, although vehicles were usually winched up the ramp rather than driven. A detachable tailcone could be replaced by a towing hook for gliders. Defensive armament consisted of a single 20 mm MG 151/20 cannon in a HD 151/2 power operated turret behind the cockpit. Provisions were made for two 13 mm (0.51 in) MG 131 machine-guns in the beam positions. Dubbed the 'Herkules' by the manufacturer, the Ju 352 V1 made its first flight on 1 October 1943, from the satellite plant at Fritzlar. The V2 second prototype flew soon after, and an order for 10 pre-production Ju 352A-Os came quickly. 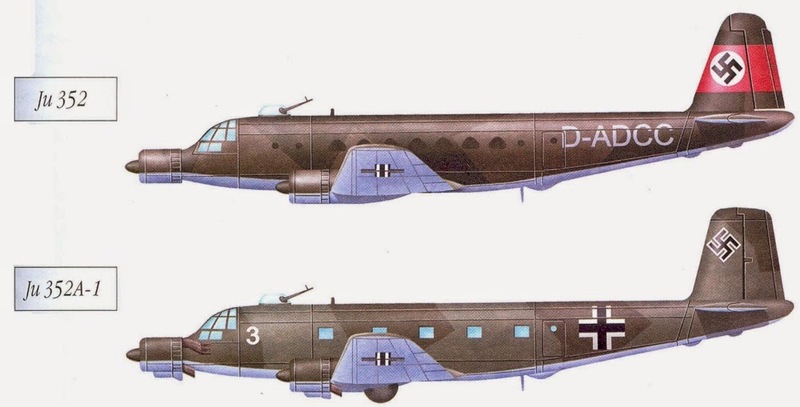 Production Ju 352A-ls were delivered to the Luftwaffe from February 1944, but by the summer the worsening war situation led to the cancellation of transport aircraft production. A total of two prototypes, 10 Ju 352A-0s and 33 Ju 352A-ls were completed. In service, the type showed itself a worthy successor to the Ju 52/3m, proving rugged and reliable. The wooden propellers featured reverse pitch, which was appreciated greatly by crews, considerably reducing the landing run by up to 60 percent. The aircraft were assigned to various transport units for special missions, with most going to the infamous I./KG 200 (commanded by Major Gunther Mauss). Most ended up with the Grossraum-Transportgruppe at Tutow, although only a few supply missions were flown towards the end of the war. On 25 April 1945, 23 were still on strength but most were destroyed as the Allies neared the airfield. At least two escaped the destruction, one being captured by the British and ferried to RAF Farnborough for evaluation. The other surfaced after the war in Czechoslovakia, where it was restored and presented as a personal gift from the Czech government to Josef Stalin. 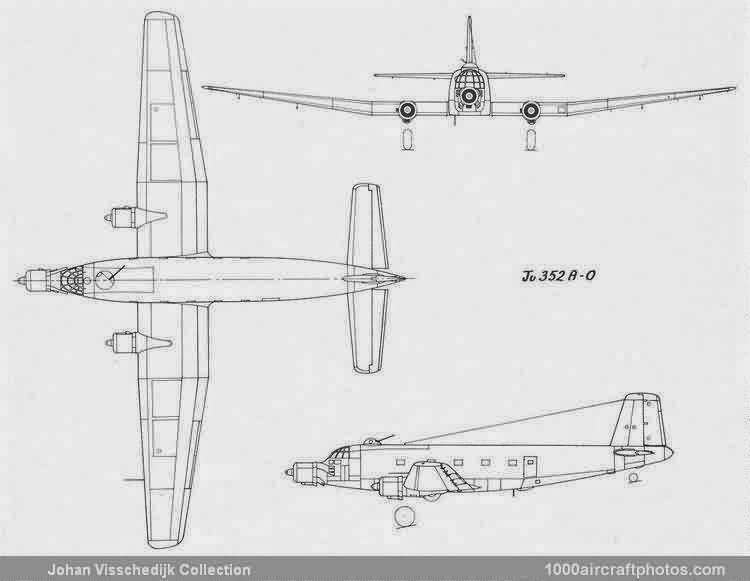 Developments were planned, including the Ju 352B with 1,800 hp (1343 kW) BMW 801 radial engines, although none left the drawing board. Powerplant: Three BMW-Bramo 323R-2 Fafnir 9-cylinder air-cooled radial engines rated at 1,000 hp (746 kW) for take-off and 1,200 hp (895 kW) with water-methanol injection. Performance: Maximum speed 230 mph (370 km/h); service ceiling 19,685 ft (6000 m). Range: 1,860 miles (2995 km) with maximum payload. Weight: Empty 28,150 lbs (12769 kg) with a maximum take-off weight of 43,200 lbs (19595 kg). Dimensions: Span 112 ft 2 3/4 in (34.21 m); length 80 ft 8 1/2 in (24.60 m); height 18 ft 10 1/3 in (5.75 m); wing area 1,379.93 sq ft (128.19 sq m). Armament: One 20 mm MG 151/20 cannon in a HD 151/2 power operated turret behind the cockpit with provisions for two 13 mm (0.51 in) MG 131 machine-guns in the beam positions. Variants: Ju 352 V1, Ju 352 V2, Ju 352A-0 (10 pre-production aircraft), Ju 352A-1 (33 production aircraft). History: First flight (Ju 352 V1) 1 October 1943.